There were several highly respected people living in Nefyn when I was growing up in the 1940’s and 1950’s. Three individuals come to mind right away. Two were famous and very well known throughout Wales - Elizabeth Watkin-Jones and Tom Nefyn Williams. Not so well known, but most highly regarded, was the grand old man of Nefyn later to become its first centenarian - John Parry Castle. Elizabeth Watkin-Jones was the author of many popular Welsh books for children. She lived in a large, weirdly-shaped house called Garth on Rhodfa’r Mor, a road that runs along the cliffs overlooking Nefyn Bay. Elizabeth (Parry) was born in Nefyn in 1887, and was the only daughter of a sea captain who drowned off the northern coast of Chile when she was very young. She was educated at Nefyn Primary School, Pwllheli Grammar School and Normal College Bangor. She published several historical novels for children including Plant Y Mynachdy, Luned Bengoch, Y Cwlwm Cel, and Y Dryslwyn – all very popular Welsh books, and most based on the local Nefyn area. She also won many awards for her writings at the National Eisteddfod. Her husband John Watkin-Jones was the head teacher of Nefyn Primary School in the 1920’s and 1930’s. He was a popular figure around town, and was referred to as John Wack. He was a father figure, and was very much respected for his efforts on behalf of the school and the children of Nefyn. I have a recollection of participating around 1946 in a concert at the Nefyn Primary School and being awarded a silver threepence by Mr and Mrs Watkin-Jones for reciting a Welsh poem that I believe was called Y Brenin (The King). As an aside, I have since been unable to find any reference to that poem. When our family lived on Church Street in Nefyn, my mother used to walk through ‘lleiniau’ and along Rhodfa’r Mor as a shortcut to the beach. There were several huge houses along that road, all facing the sea, and each house had a wall with a large lawn in the front. I recall my mother on more than one occasion pointing out the house where “the lady who wrote all the books” lived. Mrs Elizabeth Watkin-Jones was not seen much around town in her later years due to poor health. I recall a personal story related to her passing in June 1966. I was home in Nefyn from college in Birmingham, and my father had set a net on the beach at the bottom of Screw Road. We were on our way to fish the net around 4:00 o’clock the following morning. It was a very dark night and we were walking along Lon y Traeth with a flashlight. We saw a car’s headlight approaching fast along Rhodfa’r Mor, so we moved over to the side of the road by Pendorlan. The car turned around the corner on to Lon-y-Traeth, and came straight towards us. There was no pavement on the road, and the car stopped just in time directly in front of us. We were both somewhat stunned. It turned out to be the local policeman. He apologized when he realized who we were. “I thought I had caught a couple of burglars, Lawrence”, he said. He indicated that he had just received an urgent phone call, and had been over to Garth to tell the family that Mrs Elizabeth Watkin-Jones was very ill and they needed to be at the hospital early the following morning. There were hardly any houses with telephones in Nefyn in the 1960’s, even in the West End of town. Local people needing to phone had to use the old coin-operated telephone kiosk at Pen-y-Bryn, and a line would often form outside the kiosk around six o’clock on a Sunday evening waiting to make a call. Urgent telephone messages into town would be called into the local police station, and the policeman would decide whether they needed his immediate attention. Mrs Elizabeth Watkin-Jones died the following day. I remember the incident well since it was also, sadly for me, the last time I was able to go net fishing with my father on Nefyn beach. Tom Nefyn Williams was born in 1895, and was brought up on a farm called Bodeilias that his family owned near Pistyll outside the town. His father was a well-known and distinguished Lleyn poet. Tom worked on the farm and in the Eifl Quarry when he was a young man, and like many others joined the army when WWI broke out. After very bad experiences in the trenches on the Western Front and in Gallipoli, he decided to become a pacifist and spend the rest of his life preaching the Gospel. Although seriously wounded in the war, he was able to successfully complete his pastoral training in Aberystwyth and Bala. He was then appointed a minister at the Presbyterian Church in Tumble, near Llanelli in South Wales. He was immediately appalled by the terrible conditions of the miners in the area, and his sermons from the pulpit became more and more focused on the miners living conditions, housing, and their social welfare. This did not go over well with leaders of the local Presbytery, and the issue of his conformity to church doctrines etc became a major topic. He was even accused of heresy. The case was brought before the South Wales Presbytery Association, and it received a great deal of publicity both locally and nationally. Tom Nefyn, as a result, became a very well known figure throughout Wales. The dispute dragged on for a couple more years, and although compromises were eventually reached on both sides, he had to leave the church in Tumble. By the beginning of WWII, he had been re-assigned to churches closer to his home in the Caernarfonshire area. During those tumultuous years, Tom Nefyn developed his own unique brand and spectacular style of evangelizing. He became very effective at spreading the Gospel, and through his preaching, singing, and counseling he would draw large crowds not only to chapels and churches but also to village halls, open air fairs, street corners, and even to public houses. He was a very charismatic person, and people were attracted to the eloquent and dramatic style he had of delivering his sermons. He was regarded as the Billy Graham of Wales. In the late 1940’s, he and his family moved back to the Nefyn area to live on the Bodeilias farm, and he was a common sight around town. He was regarded as the itinerant preacher of the region. On the occasional summer Sunday evening, he would hold a spontaneous hymn singing and preaching session on the Groes, on the beach, or on the cliffs in Nefyn. Word would soon spread that he was at one of those locations, and throngs of people would quickly show up to listen. He was a major religious draw. My grandmother, and many other people from her generation, just adored him. I saw Tom Nefyn in action in a couple of those sessions. He was a handsome man with a flamboyant presence and overflowing with self-confidence. He would just mesmerize the crowd. I recollect him as clean cut, with a full head of white hair, dressed in a vicar’s black coat and pants, with a white collarless shirt studded closed at the neck. He was always clean-shaven with no trace of any facial hair. He used a bicycle to get around everywhere. The bicycle had a basket on the front, and he would run small errands from Pistyll to Nefyn on his bike. As young teenagers, we would often sit on the Groes on a summer morning watching the comings and goings. When Tom Nefyn was in town, he would always park his bicycle at the same spot, on the wall by the traffic sign to the left of the Midland Bank. He struck me as being a very methodical and organized person. After parking the bike, he would carefully remove the bicycle clips off the bottom of his trouser legs, straighten the pants, and drop the clips into the basket. He would converse with people he knew nearby, or with the policeman if he happened to be on duty on the Square, before crossing the road into the Old Post Office. When he returned after completing his errands, he would retrieve the clips, carefully fold the pant legs along the crease, and replace the clips before jumping back on the bicycle and riding down Well Street. A minor observation perhaps, but it kind of stuck in my mind. Tom Nefyn died suddenly on a Sunday evening in November 1958 after conducting a meeting in a Rhydyclafdy chapel. He was only sixty-three years old, and it was a huge shock to everyone in the area. He was buried in the church cemetery in Edern. John Parry Castle was a highly regarded and very well respected elderly gentleman who lived in Nefyn. He was from a humble background with most of the men in his family working in the local Gwylwyr granite quarry. He became the first man in town to reach his centenary, an enviable record for an individual who, like others from his generation, suffered so many hardships in life. He was very popular and had a great rapport with the younger people in town. John Parry was the grand old man of Nefyn when I was a growing up in the 1950’s, and he was most certainly the grand old man of Nefyn when the town celebrated his one-hundredth birthday in the Church Hall in 1976. He was born in February 1876, and lived in Pen Brynglas a house slightly up the road on the opposite side from Trem-y-Don. To put his birth year in perspective, Disraeli was the Prime Minister of Great Britain, and Custer lost his life in the Last Stand battle with the Indians in America. The 1881 census indicated that John Parry lived at Pen Brynglas with his father and mother, John and Ellen Parry, his elder brother Daniel and his two younger brothers William and Robert. His father was a setts maker in the local granite quarry. His grandfather Daniel Parry lived in Ty Cerrig, and he used to drive the mail coach for the old Nanhoron Arms. 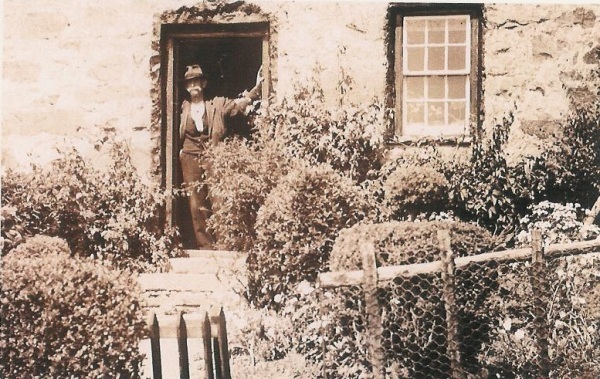 John Parry's father in the doorway of the Pen Brynglas house. Nefyn was in its heyday then as an important seafaring and ship building port. John Parry showed little interest in a seafaring career after a tragic incident off the Nefyn coast. A steamer named the Cyprian ran aground and broke up on the rocks at Cwmistir near Abergeirch in a terrible gale in October 1881. There were twenty-eight men aboard the ship, and only nine were saved. His father contributed valiantly to the rescue effort, which was made with ropes and a human chain from shore. Although he was only six years old at the time, the stories of badly mutilated bodies being washed ashore from the wreck and found amongst the seaweed on the beaches the following day, haunted John Parry for many years. 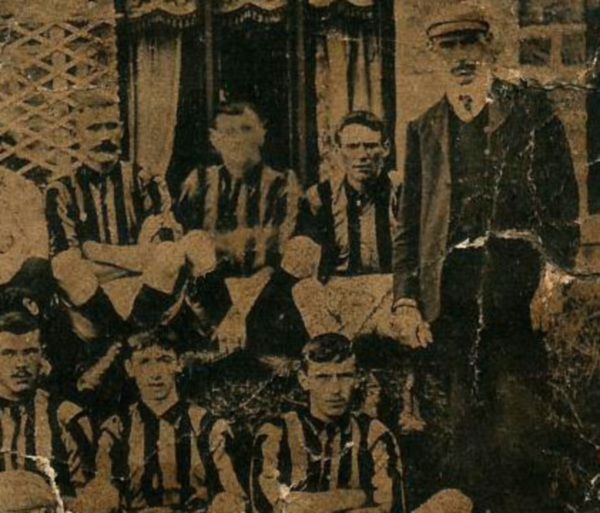 Circa 1900 partial photograph of a Nefyn football team with John Parry on the upper left. He was a very athletic young man, and played football for the local Nefyn team in the late 1890’s. He also had a fine tenor voice, and was very competitive winning many awards in eisteddfodau throughout North Wales. He left school at age thirteen to work on the land, and worked himself up to become a bailiff in Llandwrog. 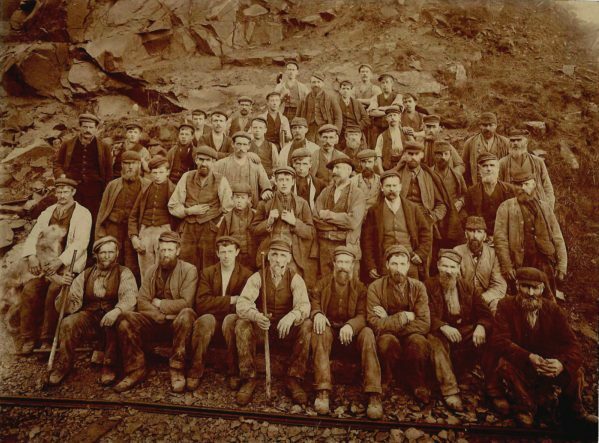 He gave up that position in 1896, and joined his father and elder brother Daniel in the Gwylwyr Quarry. He quickly established himself as a first class setts maker, second only to his father, who taught him everything about precisely cutting stone. Then tragedy struck the family. He lost his two brothers, Daniel and William, to tuberculosis within a few days of each other in the first year of the new century. They were both buried on the same day, Nov 1, 1900. John Parry was persuaded and encouraged by his mother to keep to his commitment to sing at a local concert that very same evening. 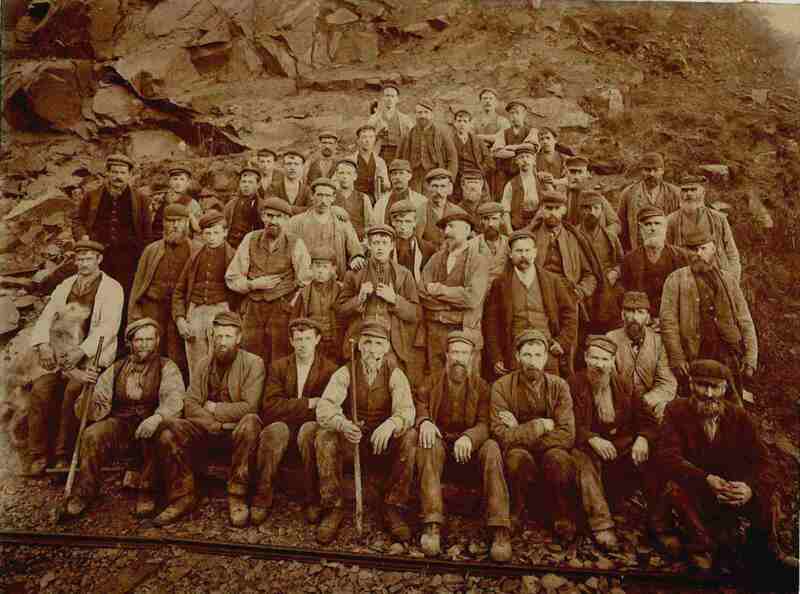 The quarrymen of Gwylwyr circa 1896. John Parry is on the upper right with his brother Daniel Parry on the upper left (with hammer). Their father is two rows in front of Daniel (with the pork pie hat).. He worked at the Gwylwyr Quarry for approximately forty years, and gained fame during that time as being one of the best settsmen in the region. It was very tough, dangerous, hard-laboring kind of work. The granite was blasted off the face of the quarry, and the setts were hewn with hand tools to the correct dimensions on the quarry floor. The setts were then loaded into a large steel cart, winched along a tramway down the mountain, across the Nefyn to Pistyll road at Wern, out along a wooden jetty, and into a waiting ship. The quarry employed approximately one hundred men in 1900, but production virtually ceased during WWI. John Parry took a job with the railways in Liverpool during that time, and also spent some time quarrying in Newry, Ireland. Production restarted at Gwylwyr in the early 1920’s, but at a significantly lower level. With the introduction of new macadam paving materials, the number of employed men continued to decrease until the quarry finally closed just before WWII. The jetty was later blown up as a wartime invasion precaution He retired as a quarryman in 1940 when he was sixty-four years old, and then started a new career as a master gardener. John Parry married a local girl in 1909, and moved to live in a house called Seaview in Tai’r Lon. He and his wife raised three children Jennie, William Daniel, and Robert John. Everyone in the family was a faithful member of St David’s Church, and John Parry was a Sunday school teacher there for over thirty years. Jennie married the son of the owner of the Bryn Cynan Inn (John Bryncynan), and they lived in Castle, a house on Stryd-y-Mynach. The oldest son Willian Daniel became a minister, and was eventually appointed chancellor of the Church at Llandinam in mid Wales. The youngest son Robert John, or Robin Rafon as he was called, became a seaman on the coastal steamers St Seiriol and St Tudno that carried cargo and passengers between Llandudno, the Isle of Man, and Liverpool. St Seiriol was credited with being one of the first ships to participate in the evacuation of Dunkirk in 1940, and Robin was a member of that crew. After the war, tragedy struck the family again. Robin was home on leave in 1946 from duties on the St Seiriol when he suddenly died of meningitis. He was only thirty- five years old. He left a wife Sadie and three young children Emrys (5), Evelyn (3), and Robin (1). The town was absolutely shocked when this happened. Robin had survived the war as a seaman, only to die a year after the war from what soon became a treatable infection. My father was very upset about his death. They were about the same age, were very good friends, and had done a lot of fishing and rabbit hunting together. John Parry was seventy years old when he lost his son. He soldiered on with life, and played an important role in the upbringing of his grandchildren. He was by now a high-end gardener, and his services were in great demand. He was responsible for the large vegetable garden behind the wall in Dderwen. I remember seeing that garden on a couple of occasions when I was in the Fron, and it was immaculate. He lost his dear wife in 1956, and moved to live with Jennie in Castle. This is when he became known as John Parry Castle. Jennie died in 1969 when he was ninety-three years old. He then moved to live with his daughter-in-law Sadie Parry and her family in Robevem. 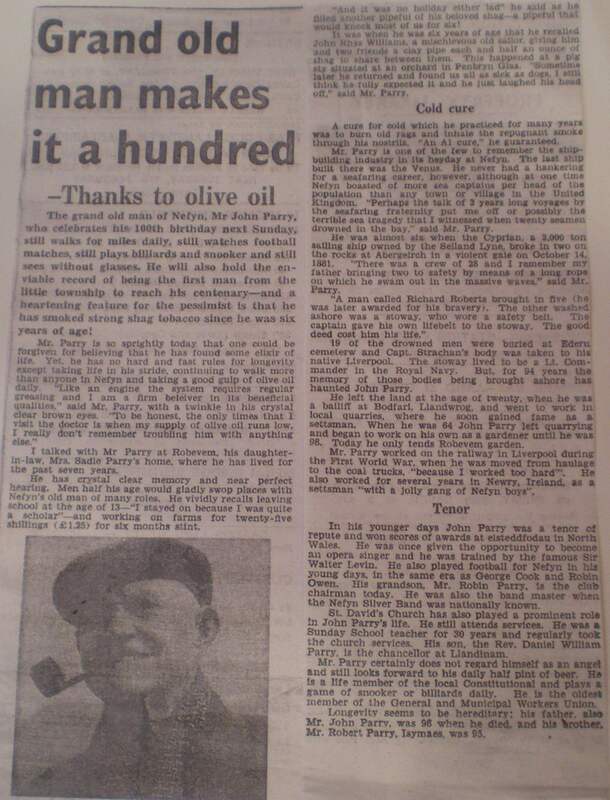 February 1976 newspaper article on John Parry's one hundredth birthday party. The Church Hall in Nefyn was full of wellwishers when John Parry celebrated his centenary in February 1976. He was still puffing away on his pipe with the strong shag tobacco that he had smoked all his life. He was still reading without glasses, still walking miles daily, still playing the occasional game of snooker at the Nefyn Constitutional Club, and still gardening in Robevem. He enjoyed watching football on television although grandson Robin indicated he would get the number of goals scored by his favorite team a little mixed up. His grandfather would suddenly shout, “Dwy goal arall (Two more goals)” when they were in fact just showing replays. He continued to be a faithful member of the General and Municipal Workers Union. He had a very youthful attitude towards life, and enjoyed talking and giving advice to young people. My son still remembers the kind old gentleman who sat on the second seat along the cliffs, smoking a pipe, and who gave him a two-shilling piece (10p) when we were on holiday in Nefyn. John Parry was the grand old man of Nefyn for sure. He passed away in September 1977. In 2010, thirty-three years later, Garth and Bodeilias farm stand as testimonials to the lives of Elizabeth Watkin-Jones and Tom Nefyn Williams And the scarred landscape on the mountains around Nefyn continue to remind us of John Parry’s generation of tough quarrymen. John Parry’s eldest grandson, Emrys Parry, is the well-known Welsh artist and retired college art-teacher living in Great Yarmouth, England. His youngest grandson Robin Parry is a past Chairman of the Nefyn Football Club and the Nefyn Constitutional Club. His granddaughter Evelyn Roberts is the mother of Elfed Roberts owner/operator of the Londis Store in Nefyn. And his daughter-in-law Sadie Parry is now in her nineties, and lives with her daughter Evelyn.